When building and creating any company you must create and execute a mission. To drive that mission forward you must have committed and engaged teammates who not only have the necessary skills but also have a passion to achieve the mission every day. “We know that always striving for perfection is a challenging goal. However, we believe that in that journey we will always be improving, delivering on our promises today and looking for ways to get better tomorrow.” Said Optimus Steel’s CEO Jim Kerkvliet. Optimus Steel declares its mission is to outperform the steel industry in safety, value, quality, and innovation. This will be done in compliance with the values of Honesty, Responsibility, Excellence, Passion, and Teamwork, committed to fulfilling applicable regulations and laws for safety, quality, and the environment. The values of Optimus Steel are on display by the employees and the leadership team. The leadership team has committed to providing the necessary resources to promote health, safety, high quality products, and environmental sustainability. Honesty – Communicating and promoting safety with integrity. Acting ethically and challenging behaviors that go against the core values of the company. Responsibility – Committing ourselves to our business in a way where everyone will benefit. Assuming the consequences of our actions. Understanding your duties and doing the best possible. Excellence – Focusing on the continued improvement of the company, using our intuition, creativity, and perseverance. Overcome obstacles to meet goals. Proposing creative ideas or solutions to problems, challenges, and opportunities. Passion – Giving our maximum effort for our company and taking pride in being a part of Optimus Steel. Persevere in the face of daily challenges and always searching for solutions. Teamwork – Collaborating effectively and constructively with others for the achievement of common goals. Sharing the processes from other areas. Supporting and motivating coworkers to be better and more effective every day. Service before self. 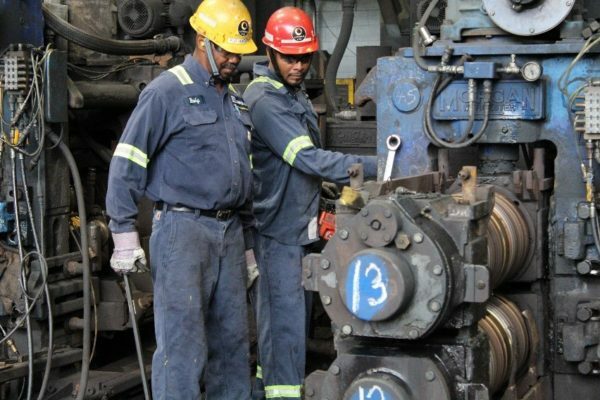 Optimus Steel employees are responsible for building the culture of accountability where safety and well-being of our team is paramount, our products meet 100% of accepted requirements, and the environment is protected. All these responsibilities are carried out with the commitment of continuous improvement, giving our maximum effort and taking pride being part of the Optimus Steel team. Community is defined as “a feeling of fellowship with others as a result of sharing common attitudes, interests, and/or goals.” That is exactly the type of environment Optimus Steel is working to create. Optimus Steel has invested in a safe and efficient environment while striving to foster a sense of family and community with all employees. Optimus Steel has also invested in offering a wide variety of community building programs and projects for the community of employees and the surrounding community as well. 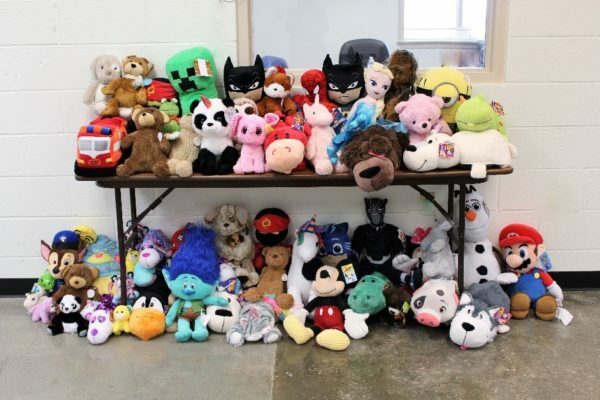 This month Optimus Steel hosted a Stuffed Animal Drive to support the Buckner House. The Buckner House is in Beaumont and all donations will strongly benefit the children in this community. On October 6th, Optimus Steel took part in the Gift of Life Julie Richardson Procter 5k Color Run. The run takes place in downtown Beaumont. 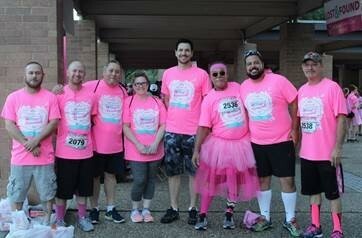 The color run benefits those fighting breast, ovarian, and prostate cancers in southeast Texas. Sign up to join us at the HR office! Optimus Steel is also involved in sponsoring the Senior Engineering Project at Lamar University. Two Optimus Steel employees will be sharing the $5,000 sponsorship for their projects. John Ingram and Jed Andresio are the two lucky recipients of this special sponsorship! 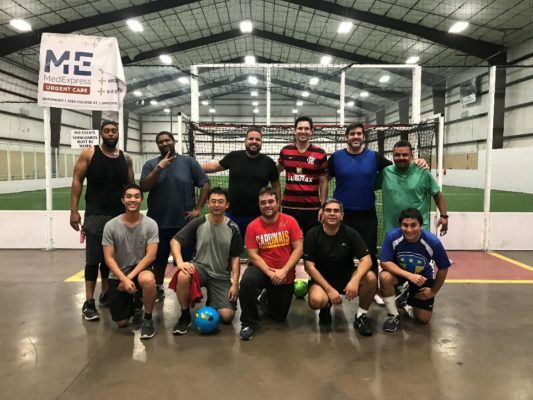 Optimus Indoor Soccer Night was created and has been hosted throughout the month of September. The Beaumont Indoor Soccer Complex has been the setting for many team fun-filled nights. The unique mix between life-long players and new players looking to have fun with their co-workers has made for a great season so far. Next up will be will be the Optimus Basketball team! We will share updates for that season and locations as soon as possible. 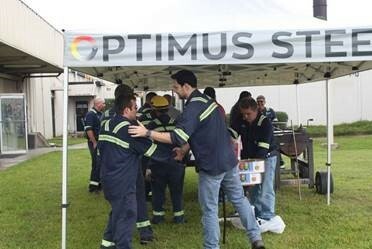 In addition to all these amazing initiatives by Optimus Steel, we hosted Employee Appreciation Week last week. Even though it was a rainy day, that didn’t stop us from showing our employees what they mean to us. To be a part of the community is always an important part of owning a business, but to create an internal community to support the values of the company is vital to its success. Optimus Steel is truly invested in being involved in both the local community and its internal community. 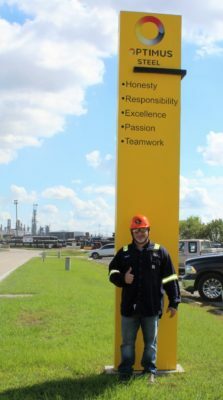 Honesty, Responsibility, Excellence, Passion, and Teamwork are inscribed on the sign in front of Optimus Steel, but those traits are truly embodied by its employees. We are thankful for all our employees and can’t wait to continue to grow our internal community. Life at Optimus Steel can be unpredictable and exciting every single day. Nobody knows that better than longtime employee Jack D. Huffman. He is the Environmental Specialist Coordinator. 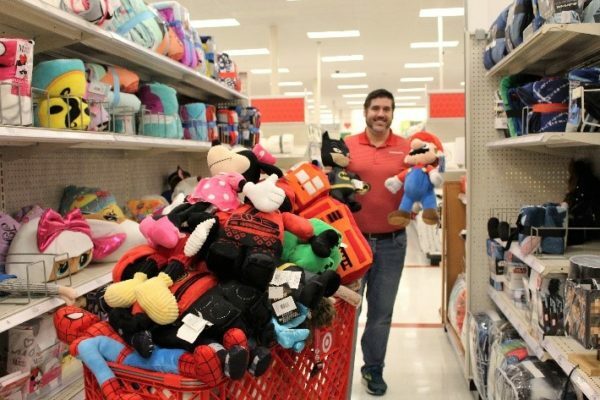 In this article, we want to highlight the work Jack and his department does, but more importantly we want to make everyone aware of the legacy he has created, a legacy that will continue after his well-deserved retirement in October of this year. 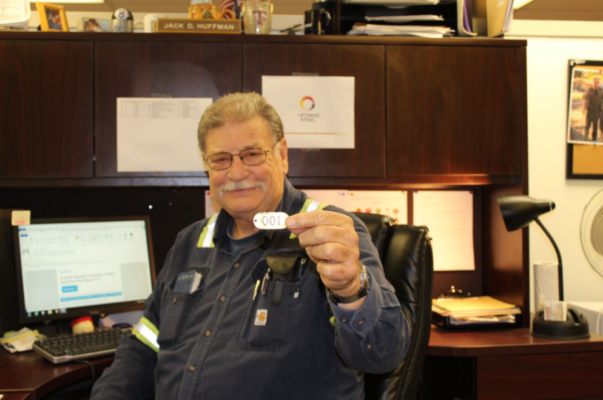 Huffman has dedicated 43 years of his life to the mill, in fact, he is employee number 001 and proudly shares this fact in addition to carrying his employee tag every day. Jack started his career as an hourly employee running the onsite water treatment plant. He was responsible for the treatment and discharge of all the water at the plant. After working at the water treatment plant, Jack became responsible for the water treatment program managing all the potable and process water including working with the City of Beaumont, the Sabine River Authority and contractors to make sure the plant always had good quality water. When Jack became a salary exempt employee, he took on many more environmental responsibilities, such as waste and air compliance, spill response, special environmental projects, and wildlife protection. “Environmental is everything, it is a lot like safety, everyone is responsible”, said Huffman. Huffman explained how important constant and consistent training is to that responsibility. He further explained how he must be tough, but fair. This is done with the utmost effort to ensure employees, the nearby Neches River and surrounding wildlife are kept as safe and unaffected as possible. “By the book” is the way Huffman works with employees even if that means the “book” of new regulations are regularly being changed. He is responsible for helping the Environmental Department constantly update their strategies and techniques to ensure these new regulations are complied with. Huffman attributes his longevity with the mill to this ever-changing “book” of regulations and his commitment to ensuring the environment is protected. To maintain the wastewater and stormwater the environmental department runs more than 11,000 analysis a year which include checking metal, oil grease, and PH levels of the water twice a week. All the tests and regulations are only part of the job though, Huffman informs us. His job also includes removing snakes and other critters from offices, equipment, and other areas of the mill, then releasing them back into a safe environment. Huffman fondly recalls a time where he had to herd a 5ft long female alligator that was resting in the middle of the road. He states he helped move her back into her environment with nothing but a PVC pipe to guide her. “You know what an alligator that size wants to do after taking a couple of steps? She wants to lay back down and rest!” he said laughing. Another time, it was a group of cats that had decided to make the mill their new home. The amazing employees of Optimus Steel stepped up and showed how they not only have a strong work ethic but also hearts of gold. A few employees adopted the cats and kittens into their own homes. There are many more stories just like these that show the true commitment Optimus Steel and its employees have to preserving and enriching the environment, with all of them supporting the vision of “Striving for Perfection in Everything We Do”, but none more than Jack Huffman. Thank you Jack for your service, your commitment to the team and the environment and the legacy you are leaving us! As consumers, business owners, employees, builders, and environmentally aware people we must push ourselves to ask, “How does this impact me?”. In the steel industry, there are often hidden values and economic advantages that we may not have considered or realized. Understanding how steel impacts everything from the car you drive to the fence around your yard to the farming equipment that was used to harvest the food you eat every day, can truly show you how invested we are as a society in the steel industry. Steel in the form of ferrous scrap is the most recycled material in the United States and worldwide. In 2016 alone, the U.S Geological Survey estimated 65 million metric tons of iron and steel scrap were processed in America. 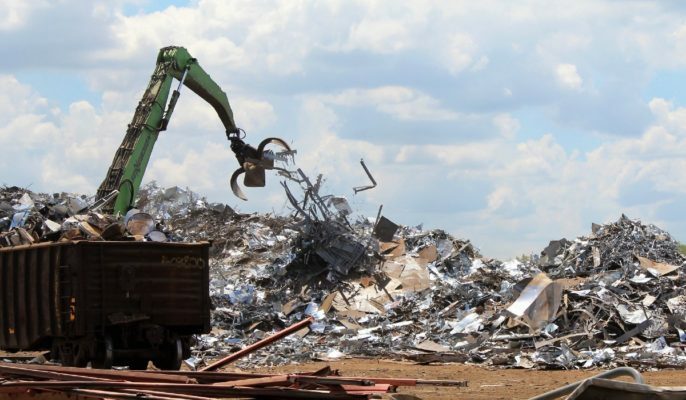 Ferrous scrap refers to recycled steel that comes from many sources with the largest being used automobiles. That means each time a car you own is processed due to accident or age or defect, you are directly taking part in the world’s largest recycling supply chain. The metallurgical properties within steel allow it to be recycled many times without compromising its quality. Virtually every steel item purchased is therefore recycled in some capacity. Steel.org reported that 90% of appliances are recycled in North American processing plants each year. Recycling this steel contributes to saving the energy needed to create steel from raw materials. This equates to enough energy to power 18 million homes. 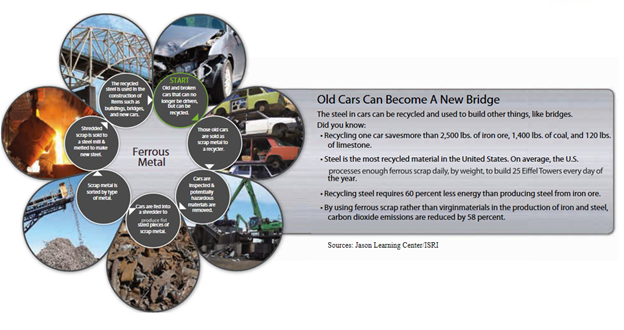 On average new vehicles purchased today contain about 60% steel, most of which is recycled. However, today’s steel differs from the steel of 50+ years ago. According to Worldsteel.org, steel is now up to 30% stronger and more dent resistant while still being about 25% lighter. So, every new car on the road now is a more recycled product than in the last 50+ years due to the American Steel Industry’s initiative in recycling. Just one recycled car produces enough recycled steel to produce more than 4 steel utility poles. 50% of the world’s steel is used within the housing industry according to the WorldSteel.org. While being an optimal recycled and sustainable product to use within a home, it also has many long-term effects that benefit homeowners. Steel frames within the house produce a safety feature in earthquake and fire disasters. It also combats termites within the home. This saves homeowners time, money, and peace of mind when it comes to the integrity and value of their home. Steel is also imperative in the food industry. When opening the pantry at your own home, you will likely see many canned food items. Due to the amazing innovation of steel within cans for food items they do not need to be refrigerated. This prevents food waste and cuts down on energy used to preserve the food within a refrigerator. The steel advances mentioned earlier in this article noted the new version of steel that is on the market today and its stronger and lighter benefits. This directly correlates to the savings it can have for builders, particularly of large projects like bridges. In addition, many builders are creating safer ways for steel foundations to absorb shocks and movement from climate change and earthquakes. In the long-term, it will help create safer structures for all that use them. Many that work within the steel industry feel a great sense of pride in what they do, and now knowing just how much of an impact they have on the daily lives of American’s, I think you can understand why. Next time you open a canned food item, get in your car, turn on a household appliance, drive on a bridge, or see a house being built, just remember these are just a few of the ways the steel industry is involved in supporting our lives as we know them.